Dear Fabricworms! 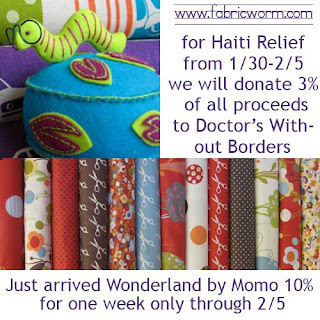 We are so pleased to announce that we will be donating 3% of all proceeds from www.fabricworm.com to Doctor's Without Borders for Relief in Haiti for the week of Saturday 1/30 to Friday 2/5. And to celebrate this special event we are offering 10% off of the Second Release of Wonderland by Momo for Moda Fabrics.